I am writing you, once again, about the terms and conditions of your outsourced workers. As you know, we are particularly concerned with their sick pay, holidays, and pensions entitlements. 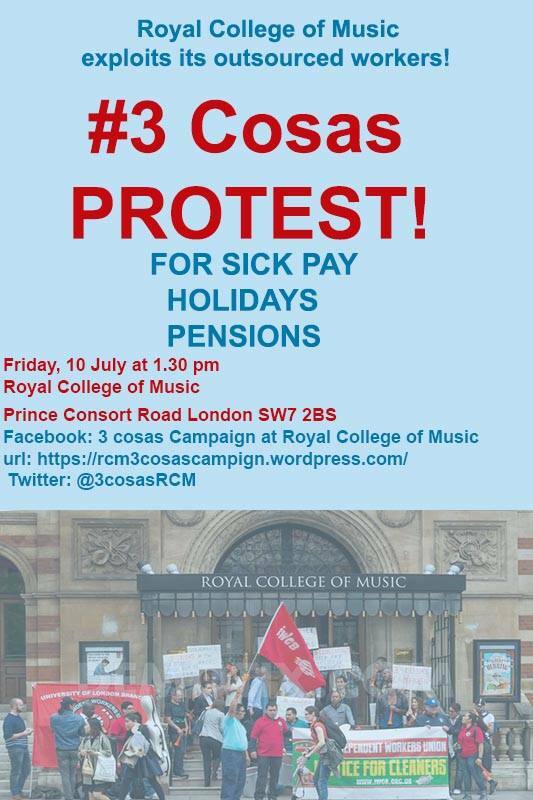 As you will be aware, we have a protest planned for this Friday as part of the Royal College of Music 3 Cosas Campaign for decent sick pay, holidays, and pensions. As you will also be aware, the protest will occur during the RCM graduation ceremony. This means that the ceremony will include loud vivuzuelas, drums, banners, placards, and hundreds of leaflets to be delivered to RCM students and their families. If activity on social media is anything to go by, this protest looks like it is shaping up to be considerably larger than the last one. The IWGB is staging this protest not because it has any particular desire to interrupt a graduation ceremony for students and their loved ones- quite to the contrary. The protest is being held because the current situation on terms and conditions is simply untenable. The lack of occupational sick pay forces your cleaners to work while sick or injured. The lack of decent holidays restricts their ability to go home and visit their family and loved ones. And the measly pensions on offer to them don’t allow them to look forward to a decent retirement. Indeed, some of your cleaners have children who they would also like to see go to university and graduate- yet the financial hardship that your stingy terms and conditions causes makes that goal all the more difficult for them. Neither the IWGB nor your workers are unreasonable. We have always been- and continue to be- open to negotiation and dialogue, either directly or via ACAS. It is the Royal College of Music that has obstinately refused to engage, preferring instead to liaise with another trade union which has no members among cleaning staff. In sum, we are writing to extend yet another offer of invitation to meaningful negotiations over terms and conditions. If the RCM chooses to engage, and has a decent offer on improved terms and conditions within sight, we are prepared to suspend Friday’s protest. However, if the RCM refuses to engage with its workers and the IWGB, then the protest will go ahead and we will publicise the fact that the RCM has preferred to allow the interruption of its students’ graduation ceremony rather than sit down and enter into dialogue with its own workers and their chosen trade union. Thank you very much in advance for your consideration of this matter. Fundraising Party – Saturday 18 July! All welcome!